The 9 Best Corn Mazes in Rhode Island! Head out this fall to get lost in a maze made of maize! These Rhode Island farms are doing fall right with challenging corn mazes—and sometimes spooky ones! It’s the perfect fall tradition for family and friends. Here are our favorites. On weekends during the fall, this corn maze comes to life from 7 to 10 p.m. Take a walk through the maze in early October for an event called “The Blackout,” where you and your friends receive a single glow stick, which you’ll use to light your way through the completely dark maze. You’ll be freaked by the folks chasing you with chainsaws and other scary creatures that emerge from the dark! If you’d rather enjoy a classic corn maze without getting your heartbeat racing, head over to Warwick’s Morris Farm. In addition to the corn maze, you and the kids might also enjoy hayrides, horse and pony rides, and picking your own apples. 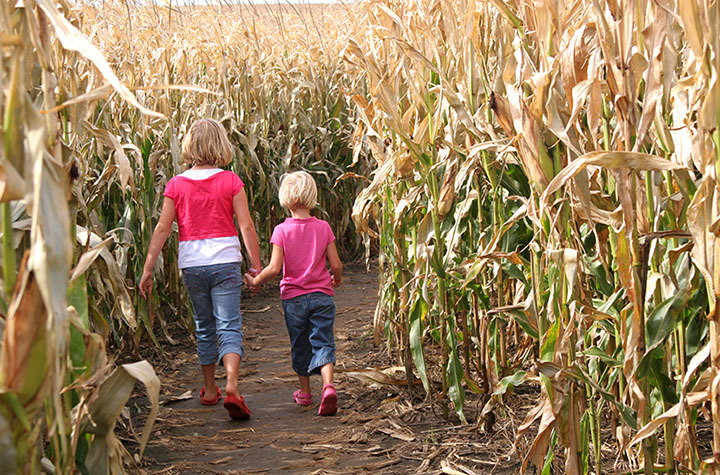 Visitors return every fall to this family-owned farm for another chance to beat the corn maze! It’s easy to feel lost at first with the tall corn stalks towering over you, and plenty of wrong turns built in! You might have to just get lucky if you plan on beating it. If you get lost in Escobar’s eight-acre corn maze, you can rest assured knowing that Escobar’s will rescue you if need be! Make sure to get there during the day, as they admit the last person just an hour before dusk. The maze opens in early September and is open all the way through the first week of November, when the tall stalks will shield you from the bitter winds! Woven into the acres of corn at Salisbury Farm is a path over a mile long. Their maze is ideal for both families and business outings for teams looking for an extra-bonding challenge! Even though the maze might seem challenging, it has been entered by thousands of people—and only a few of them failed to solve the challenge and ended up heading back toward the entrance. Every year, the Cucumber Hill Farm makes sure to choose a completely original theme for its corn maze! If you want to know what this year’s theme is, you’ll have to make sure to stop by the maze yourself! While you’re there, you can also enjoy pick-your own pumpkin patches and a flashlight maze. Plan a time this fall to head out to Confreda’s Fall Fest! The farm recommends that you start your visit in the morning, when school groups won’t be there and fewer guests are visiting. After the corn maze, enjoy fresh-made apple cider donuts, pick-your-own pumpkin and tractor-pulled hayrides! Spring Hill Sugar House has been preparing for months for its Annual Farm Festival. Enjoy venturing through the corn maze, learning how to press your own cider, and picking your own pumpkins! There are plenty of activities for kids and families, too! Visitors will appreciate the fantastic free corn maze and hay maze—which is just the right size for kids to run around on! You and the kiddos can also pet the farm animals or catch a hayride on the weekends! During the week, the farm is open until 5 p.m., and open just an hour later on the weekend. View more Rhode Island Corn Mazes.